Take care of your dogs rough nose or elbows or paws! Dry or crusty, cracked noses plague so many dogs – both purebred and mixed breeds. Dogs count on their sense of smell to give them much of the info they need and a moist, healthy nose is vital to that info gathering. For Paw-sitively Perfect Paw Pads! Sure our dogs have thick, tough paw pads, but they still need TLC! Organic, handcrafted, made in the USA PAW BUTTER TM provides layers of moisturizing support and treatment for your dogs' dry, rough paw pads. Dog elbow calluses are unsightly and uncomfortable for your dog. Plus unattended elbow calluses on your dog can lead to infection and complications. Rich, uber-moisturizers packed full of healing benefits, melt into your dog's elbows bringing comfort and easing the tightness of the elbow callus. Boo Boo Butter - Organice Dog Balm for your dog's discomforts. Take Advantage of the healing qualities of herbs and botanicals for your dog. RELAX Roll-On-Easy to use custom aromatherapy oil blend to help you and your dog relax. RELAX was created to help stressed, tense, frightened dogs with anxiety issues. Use whenever your dog seems stressed or in anticipation of anxiety including situations (thunderstorms, trips, fireworks, training class, etc) Re-apply as necessary. Since our dogs cannot tell us when they are feeling a bit anxious and could use some calming lavender, it is our job to be aware of their needs and help them as best we can. You are probably in tune with your dog more than most. By using aromatherapy oils we can share the benefit of many new herbs, botanicals and more without having to cook a batch of lavender or grow herbs on our windowsills. Shine ON Nose Polish Adds a great glossy shine to your dog's nose. 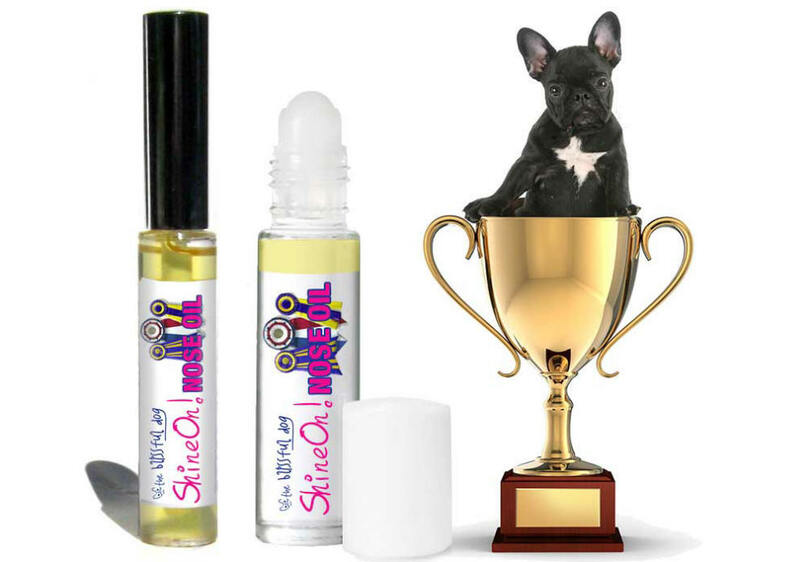 Of course, NOT just for show dogs - Shine On Nose Oil is perfect for any well-dressed dog.